Even if Ireland manage to beat Denmark tonight, it doesn’t change anything. I don’t know if this is the worst it’s been with Ireland - but it’s getting there. In the past we have had one-off performances that were terrible but you could always recover. But this is a consistent period of bad performances and that didn’t happen with previous teams, that’s why a win in Denmark, something that is possible, especially if the Danes rest players as they’ve already won the group, will not make everything better all of a sudden. What worries me now is that I don’t see a way out of it. You can’t say we are going through a bad spell and need a bit of luck to turn things around, there’s no sign of things getting better. You don’t go into a game thinking that the team will score and win, you go into every game hoping for an improvement but you don’t get that. What upsets me most about the state of the game, and the state of the national team right now, is that people don’t even want to watch any more. I speak to people back home and they’re just not interested as there’s nothing to watch, they know what’s ahead, they know what will happen in the games, and we need to change that. And I don’t know if that means changing the manager, as he says we don’t have the players but you see teams at lower levels play with a plan and style, they try to compete, and we’re not doing that. Look back at the Northern Ireland game and the way the team had so little possession. Even when you have 70% possession of the ball you still have to do something with it. We had 39% possession against the North and even then didn’t do anything with the ball, we didn’t create or trouble them, didn’t have a passing combination that looked worthwhile, it was just a poor performance. It’s a sustained period of bad form and I can’t see it getting better, there doesn’t seem to be a structure there. If it was the case that we were playing well but just not scoring you’d accept that, you can have spells like that, but we are not doing anything, not affecting matches, the players are not getting the ball into the right areas to affect games or cause other teams trouble. I don’t know many international sides who get a free kick on the half-way line and send a centre half up front so they can lob it into him, that makes no sense and you need a different way of doing things, a different style of play that gives the players belief, that they know what the options are, they know where the next pass is coming from. And at the minute that’s not there. If you look at Northern Ireland last week, they had a certain style of play. We don’t have that at all, we had no guidance. 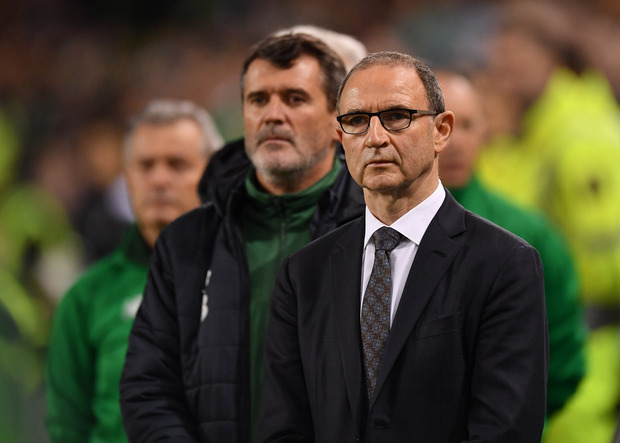 The players in the Northern Ireland squad aren’t household names, far from it, but they work the ball well, they pass it well, and that’s the biggest disappointment with this Irish team, that we don’t have a plan to go out and play. We looked a million miles away from Northern Ireland. I know there will be comparisons between the football team and the rugby squad for what they did against New Zealand. People are quick to jump on the soccer team when, say, the cricket team go on a run and win games while the football team struggle, and the rugby team are exceptional in terms of what they did. But that’s down to having top class players and a really good coach. We don’t have football players at that standard now, but there’s no reason why we shouldn’t have a coach who can organise a team and get the best out of what we have, and I don’t feel we are getting the best out of what we have. I hope Denmark tonight do rest players and we go out and beat them, gain confidence from that so we can look forward but my only fear is that if we do win the game and everyone thinks ‘that’s it, we have turned the corner’. We need to be realistic and look back on the whole year, there has been no improvement since Denmark beat us last year in the play-off, so you need a complete change, whether that’s a change of manager, or else the manager comes out and says ‘I got it wrong over the last year but this is what I plan to do now’. I played in Aarhus when we beat Denmark 4-0, 11 years ago. We had a really strong squad then but football has moved on, the Premier League is at a higher level now compared to then, we were fortunate to have a good squad of Premier League players and we don’t have the same quality of squad. Even in saying that, around that time we didn’t have the same quality as Jack Charlton had but we made the most of what we had, when we were good we were really good as we understood what we were doing, we knew our roles, we had a plan. That’s what Ireland has done through the generations, got the best out of the players available, and that’s not there now.